Our house on Saturday afternoon.... Mr 4 runs up to me very excited. Mr 4 - "Mum, Mum. Dad and I just wrapped up the box. It's a white ipad, with a red cover and it's in a box for you for Mother's day tomorrow"
Me - "Sweetheart, don't tell me anything else. I think it's a surprise". Mr 4 - "No Mum, it's not a surprise, it's an iPad". So guess what I got for Mother's Day. Whoo hoo! And I hope all the mums out there had a wonderful day. 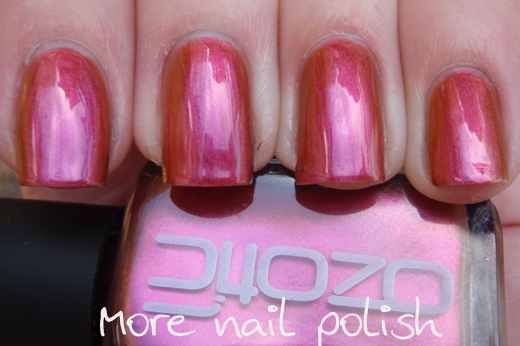 Now onto the nails and today I have Ozotic 730 duo-chrome for you. 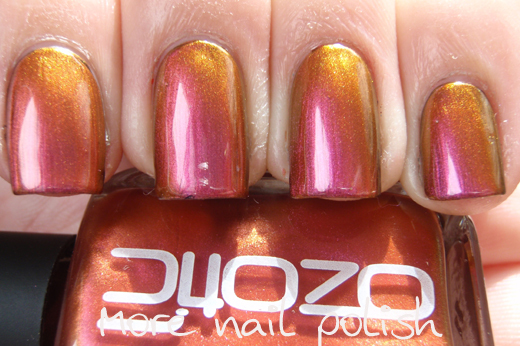 You know what, these Ozotic duo-chromes do not get very much love. Their multi-chromatic siblings seem to take all the glory! 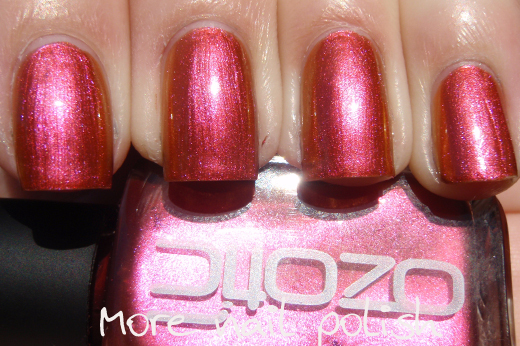 I have to admit I have quite a large Ozotic collection (one of the perks of being an Aussie and easy access to this amazing Australian brand) but for some truly unknown reason I had never tried the duo chrome polishes. 730 - Wow. I don't know if it's golden orange with a pink shift, or a metallic pink with a golden orange shift. Either way, it is freaking stunning and just as spectacular as the multi-chromes. Check this out and see what I mean. These first pictures are two coats of 730 layered over black. Next, I wanted to see if changing the base to white made any real difference with this polish. 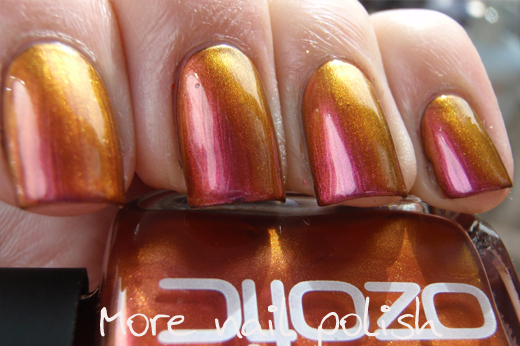 I saw some great nail wheel swatches of these duo-hromes on Picture Polishes website and some of them looked like totally different polishes. This is two coats layered over white. There isn't a dramatic difference wearing white under this one, the orange shift is still really strong, but I love that the colours are just more pastel. Last up, I tried 730 all on its own. If you have ever tried wearing multi-chromes on their own you'll know that it takes close to seventy billion coats to achieve opacity. That's why you have to wear them over black. This here is just two coats of 730 on its own. Look at the gorgeous pink sparkle in the sun. Still plenty of colour shift, even without any base colour. I'm so impressed. 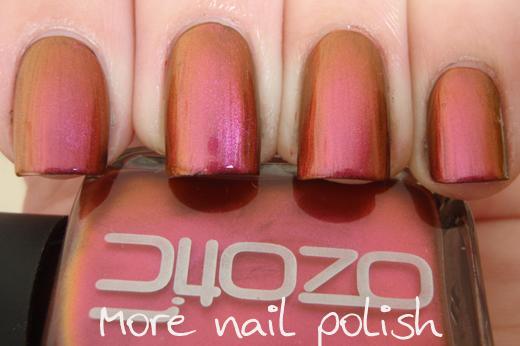 Yes, I know, nail polish impresses me easily, but damn Ozotic you really nailed it with duo-chrome 730. 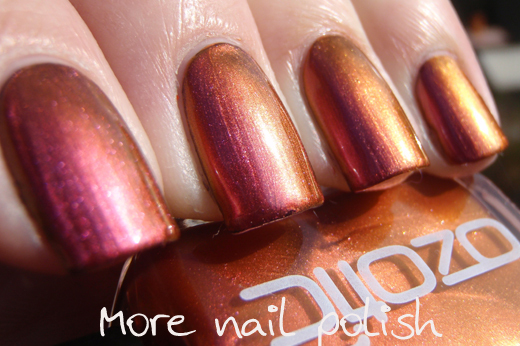 Ozotic's can be purchased from Picture Polish here in Australia for $12 (and they do ship internationally) or through the Picture Polish Network in a number of other countries. This polish was provided to me for review. I love "It's not a surprise, it's an iPad"!! Aren't little ones great? Love the 730, I have not long purchased my first Ozotics and I'm pretty impressed. I purchased 621 (mostly based on the images you put up of the stamped rose on the holo and your description that it doesn't contain glitter - which is troublesome to remove from acrylics i.e. you can't use the acetone method!) and 520. 730 reminds me of Revlon Mango Zing, which along with Revlon's Cherry Zing, are two of the only polishes I have ever used beyond half a bottle. I think I will be adding it to the list of polishes that need to be invited into my home. I tried layering a couple of Ozotic duochromes over other colours too. Can be pretty interesting :) And you have gorgeous photos, as usual! Eeeep! I need this one. Must go to Leah Ann Larowe lol. That is a seriously adorable story. Thanks for making my cheeks hurt from smiling! How cute of your little one! Haha! Happy belated Mothers Day! This polish is really pretty! In many of the pics, it gives the appearance of a gradient! Lucky you! The only time mine can keep a secret is when it's a present for me. Aren't they're whole range lovely?? 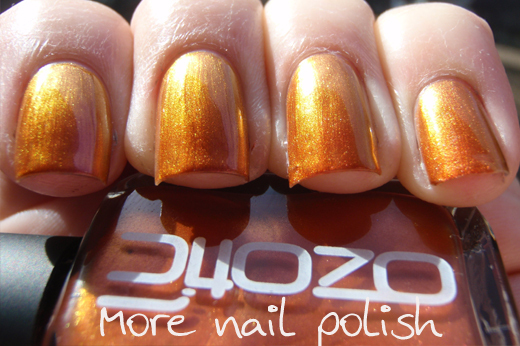 I remember seeing Ozotic around in Hairhouse Warehouse stores when I was a teenager, at that stage my love (addiction) for nail polish hadn't really set it. Now edging on to 30yo i'm wishing I had have bought more of their stuff back in the day. And isn't it sad to see that they are now stopping many lines of their brand?? It's a sad day in the world of Australian Nail Polish. That's why you have to wear them over black.